SOAR was fabulous as usual. It’s always wonderful to spend time with people with the similar passions. The creative energy is so strong that it is almost tangible. 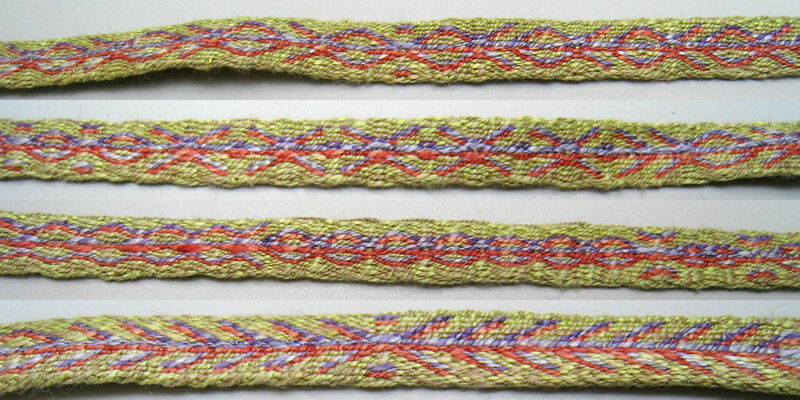 My 3 day workshop this year is with John Mullarkey on Tablet Weaving for Spinners. I’ve taken several tablet weaving workshops in the past, even one with John. I’ve taken silk spinning classes before. 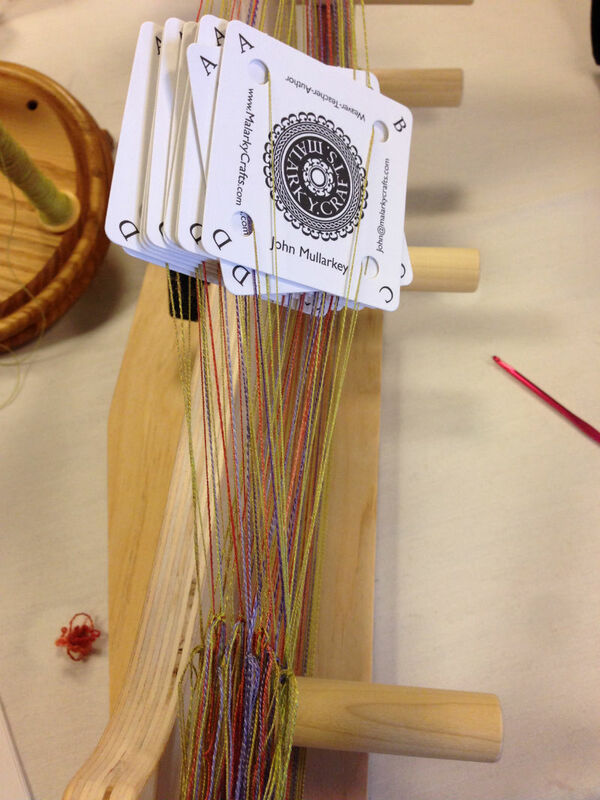 But this time, the workshop combined the two — spinning silk specifically for tablet weaving. 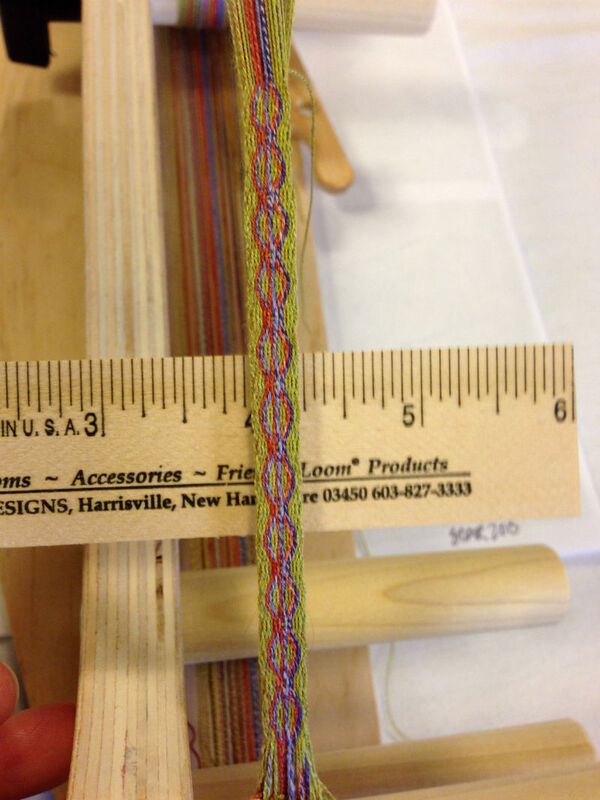 I have woven bands with my own hand spun silk in the past, but they were inkle bands. The threads had fuzzed up during the weaving process. With tablets, I expect even more abrasion. So I wanted to see how John spins the silk to withstand the abuse. We spent a bit of time on the basics with some 10/2 cotton warp he had set up before we started spinning. The orange and the purple threads in the above right photo were spun on the wheel. 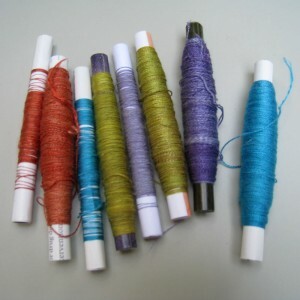 The green/yellow and turquoise were spun on my Golding drop spindle. I have found that I get better twist and ply consistency with my spindle spun than on the wheel. I’m not a treadle counter but more of a tactile spinner. 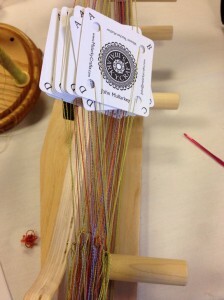 With the drop spindle, I spend a bit more time touching the threads before winding on. My default silk spinning is pretty fine. I didn’t want to mess with it because I was in the midst of spinning silk for a different project. I was afraid that if I changed the grist for the class, I might have problems with the other project. The band at right used 12 cards. 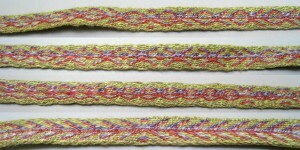 My woven band was about 1/4″ wide. 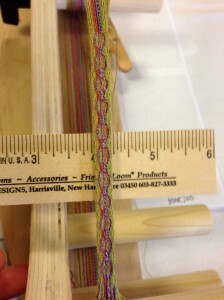 The other bands in the class ranged from 1/2″ to 1″. Yeah, I’m glutton for punishment. The colors I chose didn’t have enough color and shade contrast to show up well with the fine threads. You have to look close under good light but it was enough to keep me going. We all wove the same draft. It was amazing how different everyone’s bands looked based on color and thread size. More experiments! Of course, I couldn’t just turn cards the same way the entire time. I played around a bit on the same warp: fish going in one direction, then the other with a pair of kissing fish where they met; crosses; ovals; and arrows.